Sit down somewhere in public and draw silently. It will make you fascinating for people. They feel you must have all the time in the world. Drawing slows you way down and forces you to commit to one task. No buzz and very low speed- it makes people curious. There is also something magical about a picture emerging in front of their eyes. An invisible bond between artist, picture and audience can evolve. Such a shared experience can connect you to people you otherwise would never have met. It’s great, try it out! As an example, last week when I was drawing Marcos’s Musketeer, chirpy India Leigh walked by. Herself on an urban photo safari, we chatted a little about the van and life. We shared a moment. Even more, a few days later India surprised me with a posted description of our encounter. She writes in a wonderful style what our meeting has triggered in her. How great is that! Another example. Last Thanksgiving your visual flaneur went on his way to explore. I ended up at Alamo Square and decided to draw a sequence of the ‘Painted Ladies’. This row of picturesque Victorian houses are a ‘must see’ for any tourist in San Francisco. 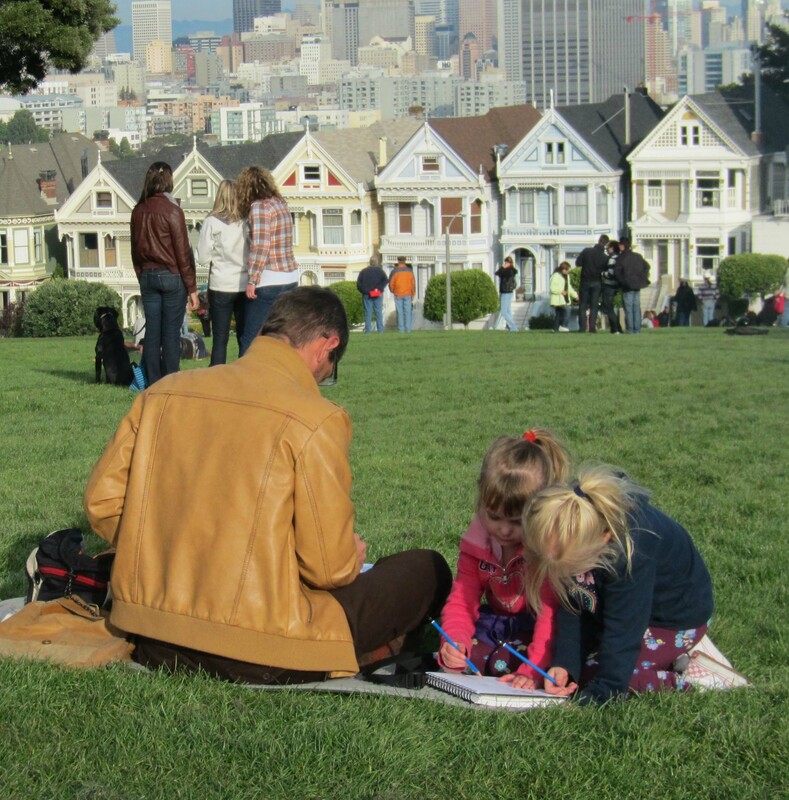 Hence it was no surprise that many transient visitors frequented Alamo Square where I had made myself comfortable. Every now and then someone glanced over my shoulders. Two girls, Imogen and Olivia, however were persistent in their shy interest. I broke the ice and asked them to join me and draw as well. They jumped at the opportunity. Their caring parents Julian and Rebecca worried their daughters would disturb me, but quite the opposite! All three of us peacefully shared a mat and drawing equipment. Occasionally we would show each other the progress in our drawings. Here are the finished pieces. I love the girls’ picture – so much raw energy ! Here is mine, which eventually got published in Synapse, a local newspaper. .
…and a picture of us at work. I bow low, honored to be part of such a charming post about your openess to sharing your art with others. I bet those little girls would have been delighted that you happily shared your sketch pad and gave them the space to fill with their art too. Keep on doing what you’re doing. It’s a wonderful thing. Thanks India, very flattering of you. Beautiful work. I love it all. Thanks Tommy! I am honored by your opinion. wow what a story! and those girls are sooo cute!! 🙂 also, maybe i should start reading the synapse…? Thanks for the compliment Angi. Synapse can be worth checking out ;-). 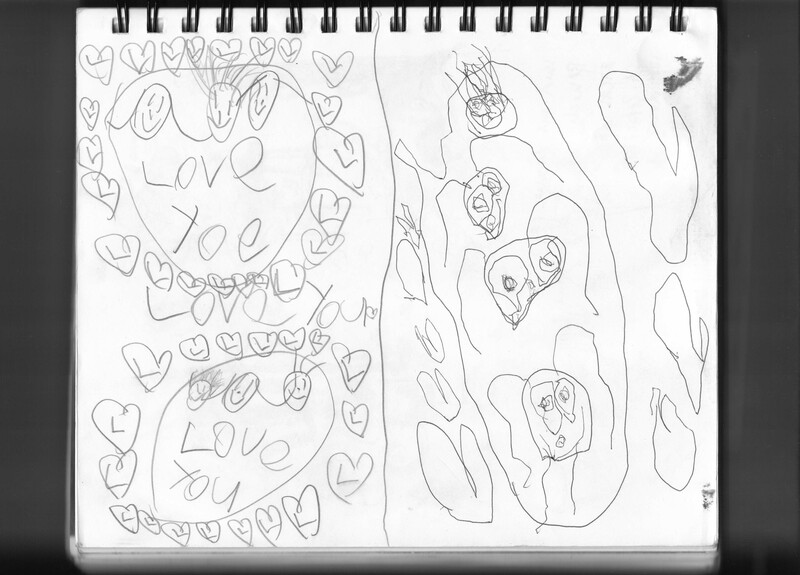 What a lovely story and sketches! This is what being an artist is all about–sharing it with the world. Welcome back Jennifer! I agree the sharing part is very satisfying.